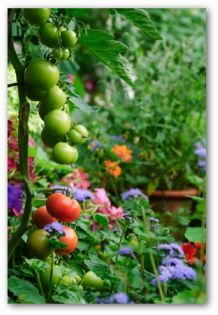 Get the scoop on growing tomatoes in pots, and learn how to grow tomatoes in a container garden. 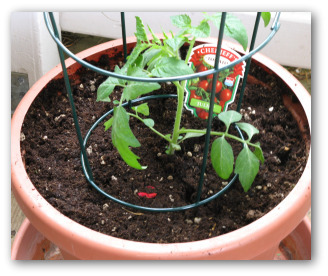 Easy tips for planting and caring for tomato plants in a potted or container vegetable garden. 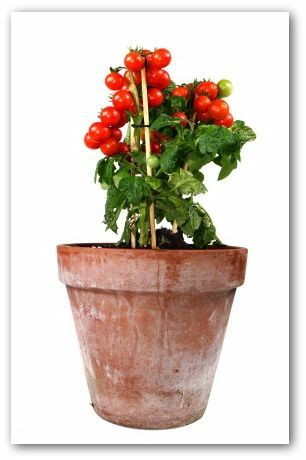 Tomatoes in pots is an ideal solution if your available vegetable gardening site lacks sufficient space or sunlight to grow these sun loving plants. Both determinate and indeterminate tomatoes can be grown successfully as container plants using the appropriate sized containers. 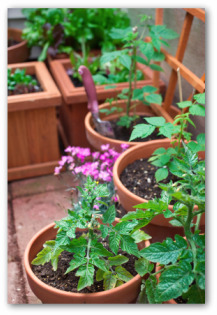 Watch our video on how to plant a container garden including tomatoes in pots. With a portable container garden, your can position the pots ideally where the vegetables can soak up the most rays. Any size or type of planters can be used. You can equip large barrels, buckets, or wooden crates with casters so the tomato plants can be wheeled from one sunny location to another. Choose pots or containers that are appropriately deep and wide enough to accommodate the growing tomatoes. 3-5 gallon size containers are usually adequate. Place a layer of enriched potting soil in the bottom of the pot. Pack the spaces around the roots and fill the pot around the plant with the rich potting mix. Container plants, even in the best planting mediums, can dry out quickly. Make certain to keep tomatoes in pots well-watered. Water thoroughly when the topsoil is dry to the touch, so the moisture reaches the bottom of the pot. Soil tends to dry out quicker in clay pots than in plastic containers. You can remedy this problem by lining your the clay pots with heavy pieces of plastic. Make several holes in the bottom of the plastic liner to ensure proper drainage. Wooden tubs can also be lined with plastic sheets to prevent the wood from absorbing moisture meant for the soil. When plants are to be brought back indoors for the winter, due care should be given to the growing tomatoes in pots. To minimize the stress of changing environments, relocate the tomatoes in stages. The transition for plantings grown outside in containers is usually easy. Many patio plants can survive very cold fall nights. However, the longer they are subjected to cold temperatures, the more difficult it will be to acclimate them to inside warmer conditions. Widely adaptable to a variety of soil conditions, growing tomatoes in pots is a favored technique among many gardeners. There are hundreds of tomato varieties available in various colors, shapes, sizes, flavors, textures, and maturing rates. Tomatoes come in all shades of red, pink, purple, yellow, and orange in solid colors and strips. The good-sized late season slicing types usually require up to 90 days of warm weather to mature. Medium to large pear shaped fruits with extra meaty interiors are grown for canning and making sauces. Growing tomatoes in pots such as Italian paste tomatoes is an excellent idea for putting up quarts of marinara sauce each season. These vegetables are ideal because they have a lot of meat but very little juice, which allows them to cook down rapidly to a thick paste. Small and medium slicing kinds of tomatoes mature on average in 50-75 days. Determinate plants are the earliest to mature fruit and are not usually caged or staked in the vegetable garden. Indeterminate tomatoes are generally ripe by mid-to late summer and continue to grow and produce until killed by frost. The indeterminate type are best grown by trellising, caging, or staking. Hybrid tomato selections offer fruits that are disease resistant and suitable to long term storage. When it comes to taste, growing tomatoes in pots of the old fashioned open pollinated variety remain the best in the opinion of many old timers who know their way around a vegetable garden.